I made another feeble attempt at pretending I was mountain biker. With Mark who had recently arrived in Wellington, and is hanging out with with the folk from the Wellington Tramping & Mountaineering Club joining in the fun. I must say, I am not (yet?) a very good mountain biker, and it certainly showed. We started with the hardest bit, as I described as “aerobically challenging” with the slog up to Mt Kaukau. At an hour for the first 3km, completed it wasn’t looking good to make it all the way down to Red Rocks. 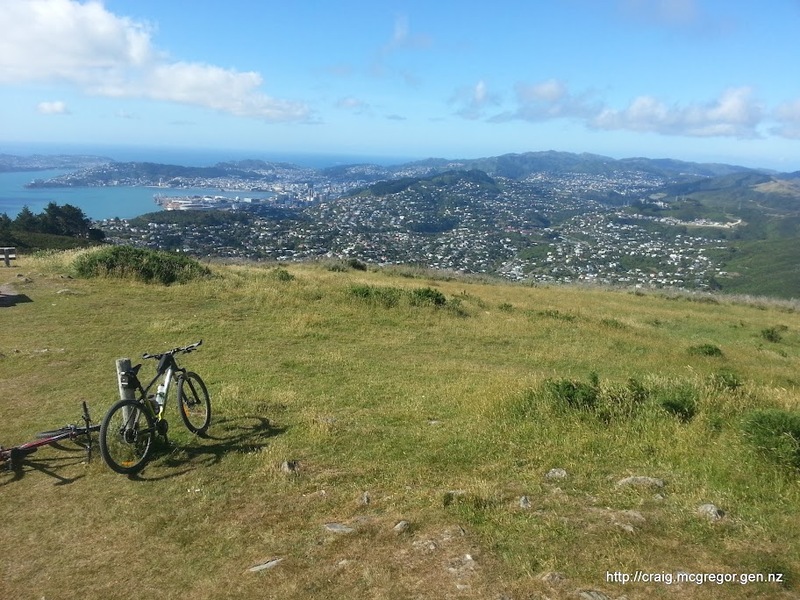 Once over Mt Kaukau, the riding seemed to get easier and we picked up the climbs up Johnsons Hill, Makara Peak, Brooklyn Wind Turbine, and Hawkins Hill along the way. Not the fastest, but had a lot of fun finding new local territory to explore. In general the tracks in the mountain bike parks, even with their deliberate obstacles were easier to ride than lose rocks, and deep rutting we found on the shared walking/livestock/biking trails. I particularly enjoyed the end-to-end aspect of the route that provided a feeling of having ridden somewhere – especially with a contiguous route off-road route free of motorised traffic (until the return ride home). Mark, told he me he saw more of Wellington on this ride than in the previous two months he had spent living here. There were plenty of views, and I should have taken a lot more photos while I was catching my breath. It was a fun outing for the day and raises the question of why hadn’t ridden this ride sooner? 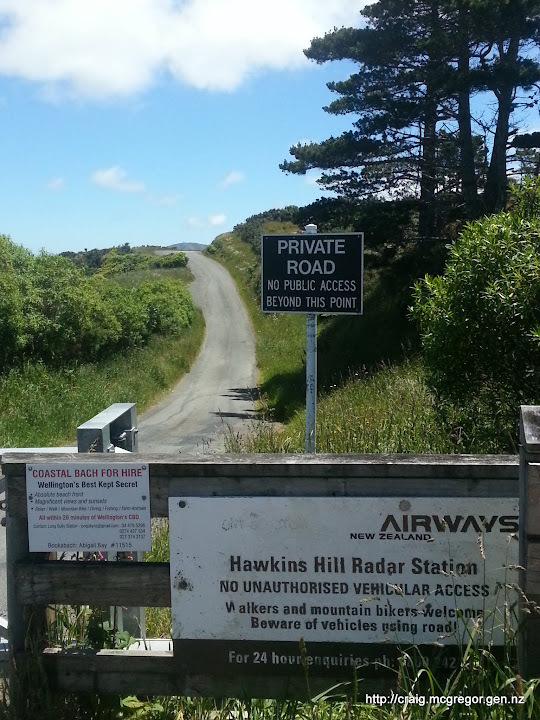 Slightly contradictory set of signs approaching Hawkins Hill. Don't bring your road-bike, and don't run! But is a mountain bike a vehicle? To Ride, to Race or to experience Adventure? – choose three! My post-Taupo thinking, now that have the full collection of helmet caps is toward not only finishing but being competitive. I am certainly no natural athlete and are unlikely to come close to that top step. The goal is to be competitive with those that choose to race. To not be making up the numbers, a few of hours off the back. I have more than proven I can finish events, including those with high DNF rates. Time to step it up. I have always said “ride" when others have said “race”. Can I change my mind-set? But next year, the goal is set, and it has set both early and high. The goal is four laps in under 30 hours in next year’s Maxi Enduro. This is a high-bar, an hour per lap less than 2012. To achieve this I am going to have to achieve a few things that are foreign to me – proper nutrition and a methodical, planned approach to training. This should see me drop 7-10kg of the “insulation-wrap” that I carry with me everywhere. I have always favoured adventure, over racing in my outdoor activities and this no doubt, will continue to be. But for multi-lap events, and events I have done before I think it is time to “step it up”. To step it up, I will need to be leaner, fitter and stronger. It is always important to me to keep the fun, the adventure in all things. It keeps you fresh. It keeps you inspired. To this end, obtaining the base fitness I’ll spend more time on the mountain bike finding new places to explore, tramping and climb the odd mountain. Dabble in some trail running (or more likely marginal trail-jogging) and use randonneuring rides into new and different places as a means of building the base. It will be about incorporating the desire and fun of adventure with a more disciplined training focus. Without fun, without adventure, the risk of becoming stale and bored in training is too great. In boredom all fitness gains are easily lost. With careful thought, adventures will build the base, but 10 weeks beforehand a tunnel-visioned focus must consume me. A time to focus on the specificity of training what is required to achieve the goal that has been set. Buckle your seatbelts, and lets enjoy the ride, or is it a race? Before the start with my Mum & my Dad. I wasn’t this near Joshua Kench for very long! Official event video – mostly the one-lappers on Saturday. Get really severely crook six weeks beforehand. Ride 1200km with mild heatstroke three weeks beforehand. Stop at Burger King Turangi for a snack two or more times during the ride! The start-line contained many familiar faces with legends Joshua Kench, Colin “WAL” Anderson, Graperide Ultimate Champion Greg Manson, Tim “The Potato Guy” Neal, Andrew Morrison and others. And others with non-riding support from Stu Downs, Lis, Helen and Tarbabies Paul Barnes and Rick & Jo. Team Potato Guy was represented by Tim, Andrew Morrison and myself. Unfortunately Tim & Andrew were only able to complete two laps each, so we have since claimed to be the first ever 3-person 8-lap Extreme Enduro relay team as we completed the eight laps between us. Off the start-line I was able to hold Josh’s wheel for at least 3 metres – in the “neutral” zone! I didn’t see Josh again until he lapped me on the way up Waihi Hill on my third lap. The last 50km of the first lap, following the left-hand turn onto SH1 was in reasonably heavy, but friendly traffic with many cyclists arriving for the 160km and relay events beginning the following morning. I also received great support from some of the Onslow Tarbabies on their way, with Mike Faherty & Dave Flynn stopping to wave their Tarbabies jerseys as support flags – thanks guys. I really appreciated the support. I rolled around the first lap in 6h30m which was a half hour outside expectations. I found myself amongst some of the next days one-lap riders out for light spins, enquiring about the Enduro events on the way into, and out of the Caltex Station that acted as the interlap checkpoint. Traffic in Taupo was heavy as I idled my way through town, More concerning however, were the stats coming out of my heart-rate monitor. I knew that I would not able sustain these stats for another three laps, with my heartrate well up on where it should have been relative to the effort. 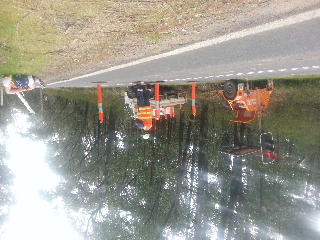 This most likely pointing to a lack of recovery from my previous ride, the 1200km Great Southern Randonnee. I stopped for a snack at the farmstay 10km into the second lap, which turned out to be well timed as the a heavy rain shower passed over while I was dry inside. In the first half of the lap, Alistair and I rode past each other a few times whilst faffing about eating, or organising lights and/or reflective clothing etc. With Mt Tongariro letting off some steam earlier in the week, I thought there may have been viewing in the night but the live screening of “Volcano” had apparently been abruptly cancelled. 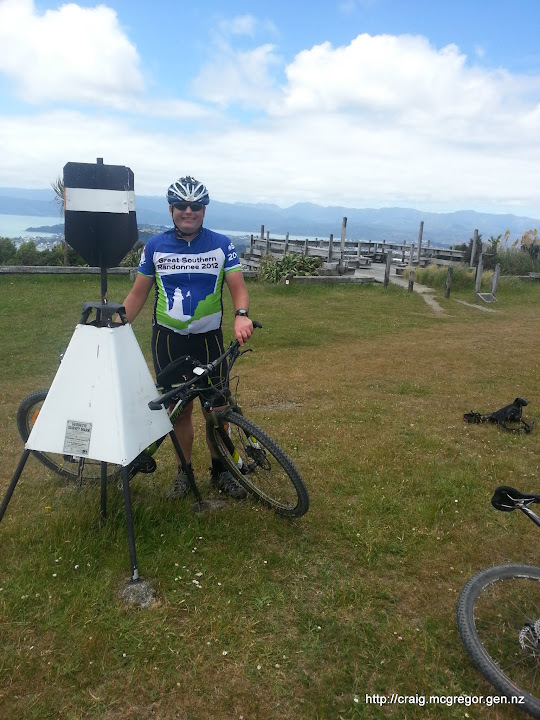 I had Tim on my wheel as I approached the Turangi checkpoint. Whilst I felt like some solid food, as good as the Hammer is, I need to chew and popped inside for a late night burger. A French Patisserie would have been more ideal? I came back out for my bike to find Tim in the van icing a sore knee but was soon back on his bike. 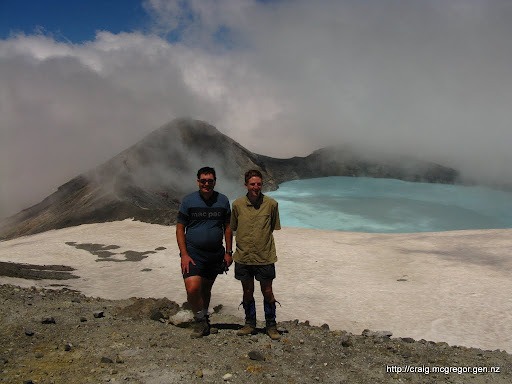 We exchanged places a few times en-route to Taupo, where Tim was unfortunately unable to continue. Two meal stops on a 100-mile lap, may make the 8h50m slightly more respectable. 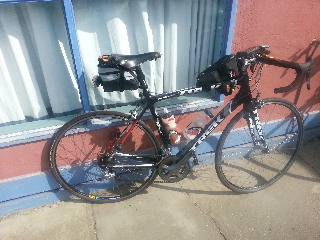 I certainly wasn’t racing and had very much slipped into 1200k generous time-limits cafe-hopping rando mode. I knew that lap three would be key for me. It would be a lap in the darkness and this is where fending off the sleep wombles becomes critical, especially once the moon goes down. Thankfully, I had good support with Dad tailing me and just before day break I jumped in the car for warmth and a 15 minute snooze before sending him back to the farmstay while the road was open. Alertness did not fully return with the arrival of the sun which has been my usual experience as I struggled to get the legs going after day break. As I made my way through the Kuratau and Waihi hills, Joshua Kench came through and lapped me. It had to happen sooner or later. He was sounding a little disappointed to be outside of record setting pace as we exchanged a few sentences. I was feeling a bit clammy and exhausted by the time I reached the Turangi Checkpoint, and shockingly returned to Burger King for breakfast, where I was able to swap “nutritional advice” with iRONman Skelton who had just finished first in the Extreme Enduro for the second year in a row. I also briefly saw Paul Rawlinson at this bustling establishment as he grabbed some food to go while supported some 2-lap Enduro riders. I seemed to be riding better with more food in my stomach as I departed BK to get the job done, passing a supportive Stu Downs who was rolling into Turangi on his touring bike. The elite race went through like I was standing still, but I did receive a rousing reception up Hatepe and into Taupo. I suspect none of these people had any idea I still had another lap to go! I was a little surprised to see Andrew Morrison cheering from the grassy slope on the way into Taupo, but he had unfortunately been forced to withdraw after two laps (his blog post here). Now realising I was the only TPG rider still rolling I was even more determined to finish. Unfortunately I was too late through to gain the benefit of any of 160km bunches and I ambled through a very hot lap. This was my 18th lap of “the pond”, and the first time I can recall absolutely no wind or movement, nor cloud or rain around the back of the lake. The tar was melting, and the stones from the chipseal sticking to my tyres. On this lap I had pretty much had enough of riding of the rough chipseal that had seemed to have been dropped on wet tar, with no roller applied afterwards. I did not want to see it again! I was struggling to find any pace and appreciated the opportunity for the chance to get an ice-cream in Turangi to help cool down before final 50km to an anti-climatic finish with no timing equipment at either the Caltex checkpoint or the Great Lake Centre finish line. Job done. I have now earned the full set of Enduro helmet caps. Yellow for the 320km Enduro, Pink for the 640km Maxi-Enduro & Green for the 1280km Extreme Enduro. Riding around the Lake, in clear weather, without a requirement to keep a close eye on a wheel in front, or a bunch around me showed many more points offering great views over the Lake than I had previously noted in single lap 160km events, or enduro’s in more inclement weather. I find myself more of a randonneur than a racer, which can make these multi-lap events with a much greater focus on performance a conundrum for me. Should I race them, or should just ride them? Should I try force myself to save time by staying on the liquid on-bike fuels the whole way? Could “racing” them make me a stronger randonneur? Could I train myself fit enough and light enough to “race” such events? I’m not sure, but I do feel like I have some unfinished business and am likely to give the Maxi Enduro another crack next year, with an aim of breaking 30 hours. This will require quite a different lead-in to the event to this year. Keith Crate & Lynley for volunteering your time to running the Enduro events. “David” who gave me a wheel to follow into the Caltex checkpoint on lap one. The GSR felt like an eventful ride for me, so it may be a while before I have a full post of the ride up. I struggled after the heat of day one, but managed to keep rotating and roll in, nursing what was left of my bottom bracket bearings in 89 hours - a whole hour to spare. About 25% of the 1200km field was forced to withdraw, mostly due the heat. The timing of the 1000km start resulted in more heat, and 2/12 finishers. I struggled to keep going from Port Fairy with cramps, high body temp and barely able to eat. Mostly survived on soup until the weather turned and cooled down. Beautiful moonlit night after the 6pm start for the 200k loop around the Bellerine Peninsula, especially when the moon was reflecting off the sea in Port Phillip Bay. 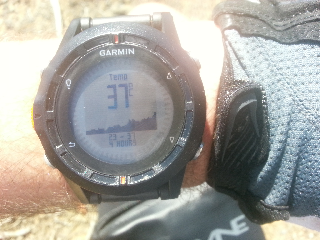 Temperature control is impossible at 37degC with little shade and no cold rivers to dunk your head in. Too many electrolytes equals heart burn; too few electrolytes equals cramp. If thou are really special you can get both on the same day! Kangaroo slalom at night.near Halls Gap would have been even more interesting if I had been hallucinating. Starting a 1200 on holiday and under a full moon reduces sleep requirements. 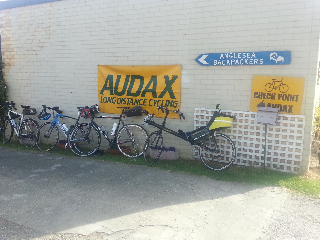 The vollies (volunteers) on Audax Victoria rides do a fabulous job looking after the participants. Bottom bracket bearings can wear out fast during a 1200 if the grease runs dry. I will be making way to the Western Islet of New Zealand shortly. This being the little island that serves as a prison colony to the western edge of this fine nation. The locals being uneducated believe they are free, and refer to their convict colony as “Australia”. 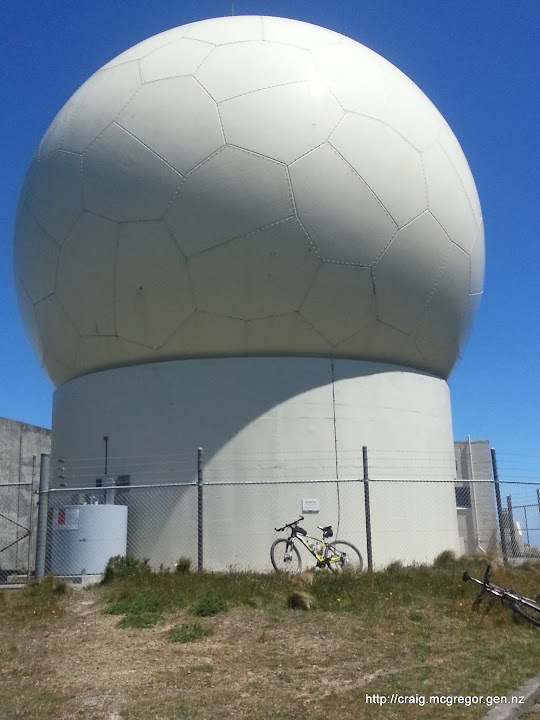 Unfortunately, the nzopengps project maps do not provide coverage for the Western Islet, and after some fickle efforts to compile OSM Australia maps myself to install on my Garmin Etrex30 I curiously discovered why the convict colony is also known as “downunder”. It is very good of Mike & Stacey to put up with me for a couple of days before I head to Angelsea for the Great Southern Randonnee. 48 others and myself have entered the 1200km event organised by Audax Australia. With the ride starting at 6PM, Monday 29 October AEST. 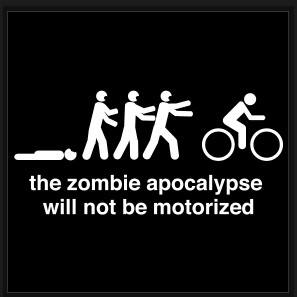 Locals along the route should be aware of the potential of 49 two-wheeled zombies arriving for halloween two days later. For myself, the training has been lacking through a miserable winter then the painful ailment of kidney stones. 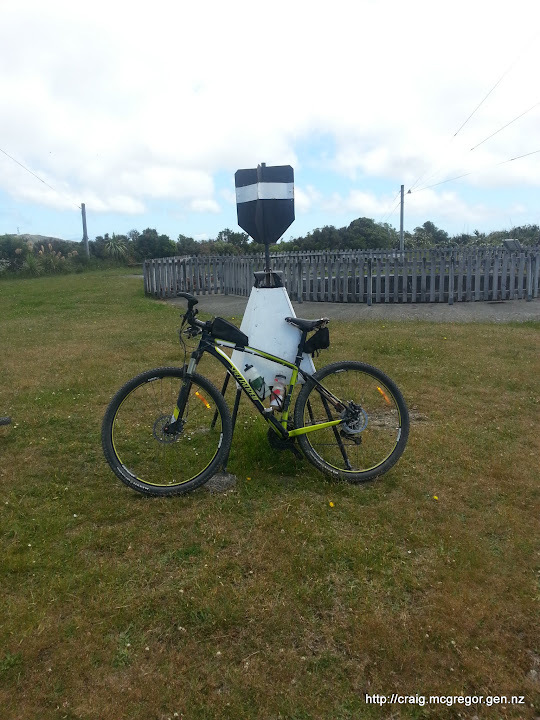 However, I was able to get in a 420km last weekend around the Pahiatua Loop and three laps of the Tour of Waikanae. That pretty much serverd as both my first and my last endurance training ride for this epic event :). Obviously I have the disappointment of being narrowly over the 90 hour time limit in the Kiwi Hunt 1200 to rectify. There is also my 1200 personal record of 85h32 to improve upon. Regardless of my lack of training, I was reasonably happy with my strength last weekend so consider the PR as on the table. Whilst the GSR has no significant mountains it does have four steep pitches of about 400 vertical metres over the Otways, of which the last two are likely to hurt after more than 1000km in the legs. There are some 20 checkpoints including start and finish, so if you are bored at your desk jump online and check my progress on my SPOT Tracker. This is several more checkpoings than the PBP, but using average speed at similar distances to get the PR I need to be tracking ahead of these times. PBP had a 30km bonus at 1230km long, so if I am able to maintain the same times (on no training)I should finish 2 hours faster. This past weekend I completed the second weekend of a Snowcraft course with the Wellington Tramping & Mountaineering Club. On Saturday we had good weather and made it up to the Crater Lake at the top of Mt Ruapehu. Having previously visited these parts in the height of summer, I thought contrasting the summer and winter photos from the same location would be interesting.